Marine Corps Warfighting Publication (MCWP) 4-11.9, Ammunition Logistics, provides guidance for commanders, staffs, logisticians, ammunition and aviation ordnance officers, supply officers, and ammunition and aviation ordnance Marines. 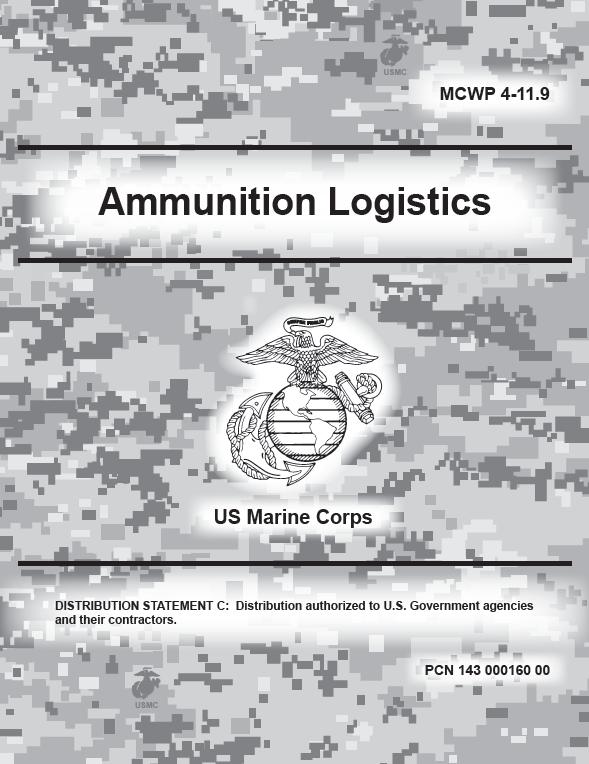 This publication discusses the Marine Corps ammunition and aviation ordnance communities’ organization and support structure, the general responsibilities of ammunition and aviation ordnance personnel, the systems used in support of ammunition logistics, planning considerations, safety issues, training, and the regulatory environment in which Marine Corps ammunition logistic operations are planned and executed. Various elements of Navy supporting establishments with ammunition responsibilities that have not been addressed in other USMC Service doctrine are introduced in the MCWP 4-11.9. Class V ammunition is a complex commodity in terms of research and development, acquisition, life cycle management, and, eventually, disposal. The Department of Defense (DOD) spends billions of dollars annually to develop and acquire new munitions and to replenish stocks expended in training and operational use. 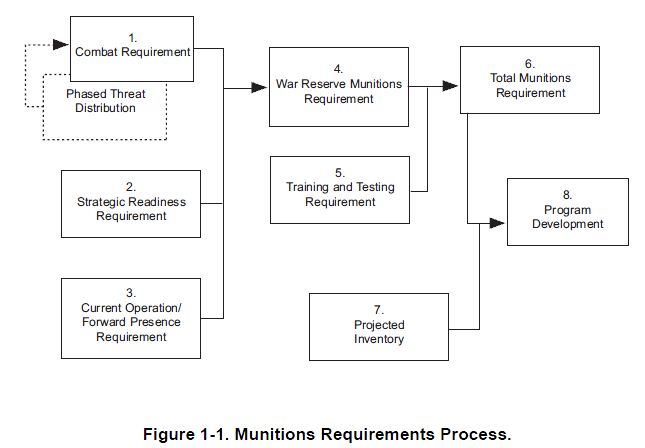 Therefore, the business of ammunition, supply Class V, is a complex and highly interrelated venture composed of planning, requirements determination, resourcing, acquisition, storage, maintenance, quality evaluation, multimodal transportation, movement and retrograde planning and execution, explosives safety, disposal, and, most importantly, sustainment of the operating forces whether in garrison or deployed. Ground ammunition and aviation ordnance are two of the most complex commodities used by the operating forces to sustain combat, contingency, and training operations. Although fundamentally a supply commodity, Class V materiel has a number of management attributes that do not apply to general supplies and requires specialized storage, handling, transportation, and inventory control methods. Like fuel or food, ammunition is a consumable item; however, ammunition is often characterized by variable rates of consumption. Thus, it must be replenished from time to time, to ensure sufficient stocks are available on short notice in the event of a contingency. In addition, unlike most consumables, Class V materiels cannot be procured on the open market. Like principal end items such as tanks or the expeditionary fighting vehicle, Class V materiel is characterized by long lead times for production; in most cases, upwards of several years. Also like a principal end item, it is funded and procured through a complex cycle of processes managed at the Service headquarters level.